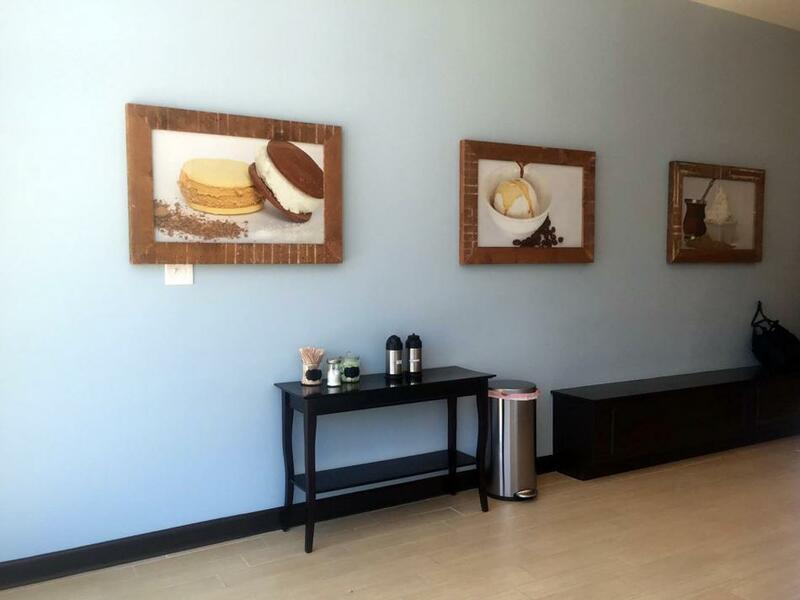 Frio Gelato opened a new retail location last week at 517 Dempster St. The shop serves Argentine-inspired gelato. With flaky pastries, freshly brewed coffee and unprocessed, uniquely-flavored gelato, Frio Gelato stands out among other dessert spots in town. The shop, which opened a new retail location at 517 Dempster St. on Friday, is known for its Argentine-inspired gelato and has gained quite a following since it opened its doors in May at 1701 Simpson Street, which is now its production facility. The atmosphere in Frio Gelato is light, laidback and fresh — everything is clean and bright, from the blue paint on the walls to the stylish font of the menu. Luciana Koziura, who works in all aspects of the business and whose father, Sebastian Koziura, owns the shop, said the goal is to recreate the happy, social culture of gelato shops in Argentina, which are an integral part of the country’s culture. At the Simpson location, Frio Gelato uses a pasteurizer to slowly blend milk, sugar and natural flavors together. The key is to churn the mixture slowly, while keeping out the air — if there’s air or it spins too quickly, the gelato tastes more like ice cream. But employee Daniel Fiddler said the shop is also unique because it’s adapted to the community. After making the gelato and assorted pastries on Simpson, the Koziuras take inventory and fill up their business truck’s refrigerator with all of the containers of gelato they’ll need for the day and drive it to the Dempster location. Koziura said she typically gets up at 8 a.m. to take stock and make sure everything is in order before the shop opens at noon. Fiddler said customers’ favorite flavors include Dulce de Leche and Tramontana, which is made up of vanilla ice cream with chocolate chips and caramel streaks. “In Argentina, we have a large immigrant community from Italy, and we have lots in common,” Koziura said. The shop’s incorporated its own flavors, though, with more sweet, milky options, citrusy flavors and other unique options. Their avocado flavor is surprisingly good, both Koziura and Fiddler said. “My stepmother is from Ecuador, where a lot of people have an avocado with sugar, so she was the one to come up with the flavor,” Koziura said. Evanston residents and siblings Keira Tu and Patrick Tu, and their friends Leo Zematis and Ralph Zematis, recently tried Frio Gelato for the first time. “I don’t have gelato a lot, but my mom really likes it, so I wanted to try gelato,” Leo Zematis, 9, said. All the kids agreed they liked the flavors they tried. Frio Gelato is just down the street from the Chiaravalle Montessori School, 425 Dempster St., so it gets plenty of traffic from children in school and the families who live within a few blocks. Less than a week in, the Koziuras and their employees are still figuring out what logistics will look like in their new location, from when there is a rush of people to what time is best to transport gelato from the Simpson Street location. The shop is small but cozy, with benches for people to sit on and eat their gelato, and pretty pictures and nicely painted walls. It’s also an example of how every member of the Koziura family is very involved in the family business. Koziura’s stepmother Karla is in charge of marketing, so she came up with a lot of the presentation of the shop, including the pictures.